This safari tour will lead you to the world-famous bird sanctuary, the Lake Nakuru National Park. You will also visit Kenya's most popular game park, the Masai Mara Game Reserve, where you can possibly see all the big five and many other wildlife species, and witness the great wildebeest migration. Come and experience this fantastic safari game drive in Kenya! In this safari, you will be provided with three nights accommodation. You will stay at several lodges or camps in Maasai Mara National Reserve and Lake Nakuru National Park. You will also be accommodated at a budget hotel while you are in Nakuru. This can be customized to suit your comfort. You will be picked up from your hotel at 8:00 a.m. in the morning and drive to the Great Rift Valley viewing scenery en route. You will arrive at the Pink Lake, often referred to its great masses of flamingos, in good time for lunch. You will have your lunch at a lodge followed by an afternoon full of game drives. Dinner and overnight will be at a lodge. Laka Nakuru National Park's claim to fame is anchored on its flamingos and the over 400 species of birds found there. The lake itself is a soda lake on the floor of the Rift Valley. You will be able to see millions of flamingos in the area. From a distance, the lake appears to be ringed in pink. The lake has also earned a reputation as an important haven for endangered species, particularly the Rothschild giraffe and the black and white rhino. Lions, water buck, buffalo, and baboons are all residents there. You will depart to the lodge soon after breakfast and proceed to Masai Mara to arrive in good time for lunch. 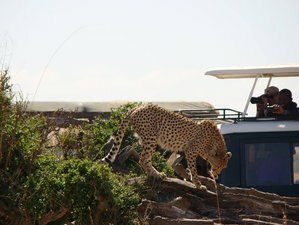 You will have late afternoon game drives followed by dinner and overnight stay at a lodge or luxury tented camp. You will have your full day spent by exploring the park in search of the big five. You can also experience the hot air balloon safari in Masai Mara which can be arranged at an extra cost. You will have your dinner and overnight stay at a lodge or a luxury tented camp. You will have a pre-breakfast game drive then you will return to the lodge for breakfast. Then you will drive to Nairobi and arrive at 2:00 p.m. where the tour ends. This safari tour will take place in Maasai Mara National Reserve and Lake Nakuru National Park located in Kenya. The Maasai Mara National Reserve is a large game reserve in Narok County, Kenya. It is globally famous for its exceptional population of Masai lions, African leopards and Tanzanian cheetahs, and the annual migration of zebra, Thomson's gazelle, and wildebeest to and from the Serengeti every year from July to October, known as the Great Migration. On the floor of the Great Rift Valley, surrounded by wooded and bushy grassland, lies the beautiful Lake Nakuru National Park. Visitors can enjoy the wide ecological diversity and varied habitats that range from Lake Nakuru itself to the surrounding escarpment and picturesque ridges. Lake Nakuru National Park is ideal for bird watching, hiking, picnic, and game drives. Daily breakfast, lunch, and dinner are included. Aside from your regular food, the menu also caters vegetarian, vegan, and gluten free meals. If you have special dietary requirements, it is a good idea to communicate it to Dallago Tours Kenya Tanzania Ltd when making a reservation. In this safari adventure, you have an option to visit Maasai village and experience riding a hot air balloon at an extra but affordable cost. Please book your flight to arrive Jomo Kenyatta International Airport (NBO).